Purpose: Owing to the large aging population, a growing number of elderly patients are undergoing surgical treatment. Surgical procedures in elderly patients are associated with a higher risk of complications. The aim of this study was to evaluate the efficacy and safety of urological surgeries in old patients. Methods: The authors carried out a retrospective study, evaluating results and early postoperative complications in patients aged 75 years and older. The cohort of patients included 221 patients who underwent surgical procedures in the department of urology between January 2011 and December 2012. The average age of patients was 78. The results and complications were categorized based on the type of surgery performed, and the Dindo–Clavien scale. Results: The median follow-up was 18 months. All surgeries for malignant tumors were performed successfully with no residual disease. Totally, 48 (22%) complications were recorded. The most serious were as follows: one patient (<0.5%) died; and four (<2%) patients underwent reoperation. The most common complications involved infection, mainly sepsis and surgical site infections. Other complications included mild respiratory insufficiency, delirium, bleeding, etc. Conclusion: Surgeries in elderly patients were effective and safe. The cornerstone of safety is careful preparation and treatment of comorbidities. Complications occurred mainly as a result of emergency procedures during emergency procedures and in major surgeries such as cystectomy and nephrectomy. The standard use of low molecular-weight heparin caused no incidence of thromboembolic disease. The average longevity of the population has increased primarily in developed countries. This has led to an increasing number of elderly patients with serious urological diseases who undergo surgery. Geriatric surgery is associated with a higher risk of complications. According to published data, the most common complications are delirium and respiratory insufficiency.1,2 The aim of this study is the evaluation of surgical results and complications in our cohort of patients. A cohort of 221 patients aged 75 and older, who underwent surgery in the Urology Department at the University Hospital Hradec Kralove between January 2011 and December 2012 were evaluated. The procedures were divided into three groups: major surgeries, minor procedures, and endoscopic procedures. The major surgeries were defined as complicated operations of duration more than 2 hours and with higher risk of blood loss. Minor surgeries were defined as less difficult with assumed duration lesser than 2 hours. The third group consisted of endoscopic surgeries, including transurethral and transurethral procedures and percutaneous nephrolithotomies. Laparoscopic surgeries were also included in the same group as surgeries with open approaches, especially because of the similarity with respect to the duration of operation and the level of risk of complications. The mean age of patients was 78 (75-84). All patients with planned urological surgery had to visit the anesthesiologic outpatient clinic of our hospital to get checked for overall well being and for treatment of comorbidities. Any disturbances in concomitant disease management had to be resolved before planned surgeries. Antibiotic prophylaxis was administered before every procedure that took 2 hours or longer, and for all procedures that involved the opening of the urinary tract. One shot of a broad-spectrum antibiotic was administered at the same time as the induction of anesthesia.3 The only exception was cystectomy, where antibiotics were administered for 7 days post surgery, and the anti-anaerobic parenteral drug metronidazole was administered for 5 days post surgery. The reason for this long-term antibiotic treatment was the use of an ileal segment for diverting urine after a bladder was removed. Thromboembolic prophylaxis was performed by administering low molecular-weight heparin (LMWH) and through early postoperative mobilization. As older patients have an increased risk of thromboembolic complications, all patients in our cohort received LMWH. During postoperative care for the elderly, the most important was nursing care. Nurses who took care of elderly patients after surgery were regularly trained on the specifics of care for the elderly. The basic requirements of this care are frequent contact with patients, regular conversations with patients, repeated explanations of medical procedures, and early and frequent mobilization of patients. Surgical results and complications were assessed during surgery or in the postoperative period for up to 30 days. The functional and oncologic results were evaluated long-term, starting at a minimum duration of 1 year after operations. All deviations from the normal postoperative course were recorded from ambulatory and hospitalization charts of all the patients. Complications were also classified based on the Dindo–Clavien scale of postoperative complications.4 The lengths of hospitalization, with and without complications, were also compared. The duration of hospitalization of patients with and without complications was statistically analyzed according to Fisher’s exact tests. The level of probability (P-value) less than 0.05 was considered as statistically significant. The median follow-up was 18 (12-40) months. Table 1 shows the type of surgeries along with the number of patients and the number of complications. Note: *Including resection of local recurrence with same surgical approach. Twelve patients underwent radical prostatectomy; four underwent open retropubic prostatectomy; and eight underwent laparoscopic surgeries. No complications were detected in patients who underwent open retropubic prostatectomy. Three patients experienced complications after laparoscopic prostatectomy. One patient suffered a respiratory infection. A standard dosage of parenteral antibiotics resolved this complication. One patient had a large pelvic hematoma and reoperation was necessary. The last patient had the conversion from laparoscopic approach to open, due to extensive abdominal adhesions. All complications were resolved and all patients were in oncologic remission with zero level of the PSA oncomarker. Twenty-eight patients underwent nephrectomy. Thirteen patients experienced complications during the postoperative period. Three patients experienced transient delirium that was managed with pharmacological neuroleptic treatment. Five patients experienced mild respiratory insufficiency that was managed with oxygen treatment via an oxygen mask for 2 days to 5 days. Two patients had voluminous serous secretion. The mean volume of secretion in a 24 -hour period was 1,000 mL (500−1,500 mL). One patient developed sepsis and fever over 38°C. Serious respiratory insufficiency was recorded in one patient, who received artificial respiratory ventilation for 6 days, with catecholamine support of cardiovascular circulation. This complication occurred in a patient who had a nephrectomy with a resection of the vena cava caudalis due to cT3b renal cancer. The most serious complication was septic shock and colon gangrene that required reoperation. During reoperation a colectomy was performed, followed by the administration of a combination of antibiotics. All complications were resolved successfully. Every surgery was completed and renal cancer fully removed. No recurrence of any tumor was recorded. Partial nephrectomy was carried out in seven patients: four patients underwent open surgery, and three underwent laparoscopic surgery. Neither perioperative nor postoperative complications were recorded. Every tumor was removed with zero positive surgical margins and no recurrence. Cystectomy for invasive bladder cancer was performed on six patients. Moreover, nephroureterectomy to prevent tumor infiltration of the upper urinary tract was performed in three of the six patients. In three patients, urine was diverted by means of an ileal conduit, and another three patients underwent either ureterostomy or nephrostomy. Cystectomy and regional lymphadenectomy were performed and the tumors were removed in all patients. A patient underwent a complicated surgery with significant blood loss – 2,000 mL. One patient experienced mild respiratory insufficiency, which was managed by oxygen support via mask for 4 days. Two patients had complications due to infection. One patient had an abscess in the surgical site and underwent reoperation. The second patient experienced a respiratory infection and was treated with antibiotics. All complications after major surgeries were resolved with zero mortality. All patients were tumor free. Nine patients underwent transvesical prostatectomy for benign prostatic hyperplasia. Six patients underwent surgery without complications, and three experienced some event in the postoperative period. Two patients had cardial disturbances; the first had symptoms of cardial insufficiency, and the second had new cardial arrhythmia. The pharmacological treatment was successful in both patients. The third patient experienced a surgical site infection. Local treatment and a new skin suture were employed. Bilateral orchidectomy as androgen deprivation treatment of metastatic prostate cancer was performed in 35 patients. All patients were fully informed about alternative androgen deprivation treatment methods as Gonadotropin-leasing hormone therapy. Four patients had complications. Two patients experienced a small hematoma in the scrotum. No active treatment – such as drainage, aspiration, or surgical intervention – was performed. Both healed spontaneously. Another two patients experienced postoperative urine retention postoperatively. The management was a temporary indwelling catheter and oral alphablockers. After 1 week, both patients had spontaneous voiding with zero or minimal postvoiding residual volume. Forty-three patients underwent transurethral resection of a tumor (TURT) for bladder cancer. Two patients experienced short-term, transient delirium. One patient who experienced the most serious complications died in the postoperative period. The patient was admitted in urgent care because of severe hematuria and renal insufficiency. Based on sonography and computed tomography (CT), the main diagnosis was a large bladder tumor. Previous treatment of his comorbidities – arterial hypertension, ischemic heart disease, and other diseases - was insufficient. The first treatment that the patient underwent during hospitalization was a bilateral nephrostomy for subrenal obstruction and artificial selective embolization of bleeding bladder-tumor arteries. The effect of embolization was only temporary. Next, the patient underwent TURT with coagulation of all bleeding vessels. The first 2 postoperative days were without complications. On the third postoperative day, the patient died due to an unexpected cardiac arrest and all efforts to revive the patient were unsuccessful. Transurethral resection of prostate was carried out in 39 patients. Eight patients experienced complications. Three patients had infectious complications accompanied by fever over 38°C; antibiotic treatment was effective. Two patients experienced urine retention following the removal of the catheter, 3 days after Transurethral resection of prostate. Pharmacological treatment by oral alphablockers was successfully administered in one patient; the second patient experienced retention relapse. The treatment was self-catheterization. One patient had transient urine incontinence managed by incontinence pads. The incontinence resolved spontaneously in a few weeks. One patient had new atrial fibrillation. Pharmacological treatment was effective. The most serious complication was massive hematuria. The treatment was endoscopic coagulation of the bleeding vessels and evacuation of large blood clots. Ureterorenoscopy was performed on 19 patients. In the postoperative period, two patients experienced macrohematuria that healed spontaneously. Two patients experienced urosepsis treated by a parenteral antibiotic. One patient with urosepsis had transient symptoms of heart failure. Pharmacological treatment was effective. Percutaneous nephrolithotomy was carried out in six patients. Two patients experienced hematuria, and one of them also had mild delirium. Another patient experienced a mild fever, but without any symptoms of sepsis, and he improved spontaneously. A specific group consisting of 17 patients underwent imperative urethrocystoscopy for serious hematuria and was admitted into intensive care. None of the patients in this group had a history of urological disease. Nine out of these 17 patients underwent cystoscopies, including the evacuation of big blood clots and electrocoagulation of bleeding vessels; four patients underwent cystoscopy with endoresection of a previously undetected small bladder tumor; and four patients underwent cystoscopy that included the insertion of a double-J stent owing to a combination of hematuria and obstruction of the upper urinary tract. One serious complication was bladder perforation during endoresection of a tumor. The patient underwent emergency open surgery with resection of the bladder wall containing the tumor, followed by suturing of the bladder. Three patients experienced urinary tract infection following cystoscopy. Parenteral antibiotics proved effective. 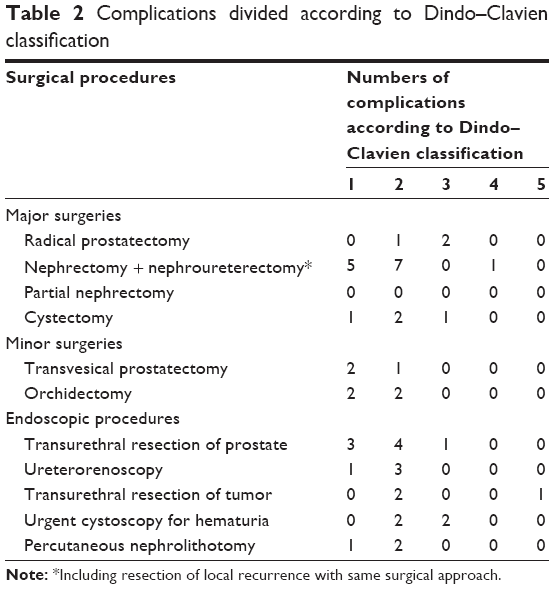 Table 2 lists the number of complications of surgical procedures, divided according to the Dindo–Clavien classification. The most common complications were respiratory insufficiency and infection. All respiratory infections, with one exception, were treated with oxygen given by mask. Only one patient required transient intubation. Infections were treated with antibiotics. A surgical site infection was treated locally. One patient died in the postoperative period after TURT. The patient underwent a large endoscopic procedure for a large bladder tumor. It is important to note that the patient’s comorbidities had not been treated. Four patients experienced serious complications treated by reoperation. Table 3 shows the comparison of the length of hospitalization in complicated vs uncomplicated surgeries. Significantly prolonged hospitalization was determined when there were complications. Patients with complications following emergency cystoscopy, ureterorenoscopy, nephrectomy, and cystectomy required the longest periods of hospitalization. According to statistical analysis, all lengths of hospitalizations with complications were significantly prolonged, except cystectomy, transvesical prostatectomy, and percutaneous nephrolithotomy. Surgery in elderly patients is associated with a higher risk of complications.1 Patients older than 74 years had limited recovery capability. Another key issue is the presence of comorbidities.5 The risk of worsening cardiovascular, respiratory, and other diseases is very probable and has to be taken into account. According to published data, the most common complications are delirium and respiratory insufficiency.2,6,7 Our experience was slightly different. Infectious complications and mild respiratory insufficiency were the most common adverse events in our cohort. They occurred in 16 (7.2%) patients; ten patients experienced sepsis; and six experienced surgical site infections. Respiratory insufficiency occurred in only ten (4.5%) patients, and delirium was recorded in just six (2.7%) patients. New cardial arrhythmia was recorded in two patients, and catecholamine support of circulation in the early postoperative period was given to six patients. Reoperation was carried out in four patients. Bleeding and large hematoma required reoperation in one patient after laparoscopic radical prostatectomy. Two patients experienced necrosis of the intestinal segment, with peritonitis. Both patients had had surgery for renal cancer and they had a history of local recurrence of renal cancer and two or more previous abdominal surgeries. The absence of alternative treatment such as chemo or radiotherapy was the main reason for the surgical resection of the recurrence. The last patient with reoperation had a stercoral fistula after cystectomy. The stercoral fistula was on the ileum in the stapled anastomosis, performed after the removal of an ileal segment used for diverting urine. All three patients underwent open resection and temporary ileostomy. One patient died from cardiac arrest after TURT with unsuccessful resuscitation. The actual reason for cardiac arrest remains unclear. The patient had a number of comorbidities, with no or minimal treatment, before he was admitted into intensive care. The main reason behind the patient succumbing could have been insufficient treatment of chronic heart disease and other comorbidities. Emergency TURT in this patient was performed because of massive hematuria and the transient effect of artificial embolization. Unsurprisingly, the riskiest surgeries were the most serious ones, such as cystectomies and nephrectomies for large tumors. No complications in partial nephrectomies were a chance occurrence. A possible explanation for no complications could be the small size of tumors and a very good performance status of patients. For patients with serious comorbidities, alternative procedures were chosen, mainly radiofrequency ablation or careful observation of the patient over a period of time. These alternative procedures are inappropriate in the case of large renal cancer. The low occurrence of delirium could be associated with careful preoperative preparation. This would explain its higher occurrence in patients who underwent emergency endoscopic surgery for hematuria. Retention of urine was also rare and transient. Temporary bladder catheterization and oral alphablockers were successful in all cases except one. Thorough preoperative preparation, careful scheduling and implementation of anesthesia, and special nursing care for geriatric patients during the postoperative period are the most important requirements in the prevention of complications. Excellent results were achieved thanks to a nursing team specially trained to care for elderly patients.8 The results achieved in our cohort confirmed this. We place great emphasis on preoperative preparation, especially the management and control of all comorbidities. The higher incidence of serious complications and significantly longer hospitalization was evident in patients who underwent emergency endoscopic surgery. The death of a patient, who had had minimal or no treatment of comorbidities, after TURT is consistent with our observations. Regular administration of LMWH and early mobilization of all patients resulted in the absence of thromboembolic disease. All patients older than 50 years have an increased risk of thromboembolic complications and LMWH is given regularly to all older patients in our department. The overall incidence of complications was 22%. The great majority of complications were treated with an appropriate regimen and/or pharmacologically. The mortality rate was <0.5% and reoperations were performed in <2% patients. The surgeries of elderly patients (age 75 years and older) were safe and effective according to our data. The quality of preoperative management and the treatment of comorbidities are very important. Most complications stemmed from infections and transient respiratory insufficiency. The single-shot antibiotic prophylaxis and a standard LMWH regimen were very effective. Elderly patients require specific care for preventing complications. The most important aspect is meticulous preoperative preparation, especially long-term control of comorbidities. All patients older than 75 years for whom urological surgery was planned had to visit the anesthesiologist for the assessment of performance status and treatment of any concomitant disease. In case of poor compensation of comorbidities, it was recommended to improve treatment and to postpone the surgery. The next important point is adopting an active postoperative approach to patients. The nurses of our department are instructed in regular seminars designed for training on managing elderly patients. They are coached on the necessity of early mobilization and repeatedly explaining all treatment procedures to patients. The main reason for providing this training to nurses was the increased number of elderly patients in our region and demographic trends showing the aging of population. The main limitation of our study is the smaller number of patients in some groups of surgeries, especially radical prostatectomy and partial nephrectomy. One of the principal reasons was careful consideration of indications. The less invasive nonsurgical procedure was carrying out in elderly patients with serious comorbidities. Patients with small renal cancer underwent radiofrequency ablation of small renal tumors and patients with prostate cancer were treated radiotherapy, hormonal treatment or by watchful waiting. The division to major and minor surgeries may be associated with some uncertainty. Some minor surgeries, for instance very large prostate treated by transurethral resection, could be similar to a major surgery. But this division was necessary for evaluation the whole cohort of patients. An aging population causes an increase in the number of elderly patients getting surgical treatment. In our retrospective study we proved the safety and efficacy of surgery in patients in age 75 years and up. A scheduled procedure, combined with high quality treatment of comorbidities, is crucial. All surgical procedures fulfilled their objectives. No residual tumors were recorded after oncologic surgery. Complications due to infection were the most common. The riskiest procedures were cystectomy and emergency cystoscopy with transurethral resection of bladder-tumor caused by massive hematuria. The study presented in this paper is supported by the PRVOUK program P37/04. Revenig LM, Canter DJ, Taylor MD, et al. Too frail for surgery? Initial results of a large multidisciplinary prospective study examining preoperative variables predictive of poor surgicaloutcomes. J Am Coll Surg. 2013;217(4):665–670. Robinson TN, Eiseman B. Postoperative delirium in the elderly: diagnosis and management. Clin Interv Aging. 2008;3(2):351–355. Brodak M, Pacovsky J, Kosina J, et al. Antibiotic prophylaxis in urology. Rozhl Chir. 2009;88(7):357–363. Dindo D, Demartines N, Clavien PA. Classification of surgical complications. A new proposal with evaluation in a cohort of 6,336 patients and results of a survey. Ann Surg. 2004;240(2):205–213. Robinson TN, Eiseman B, Wallace JI, et al. Redefining geriatric preoperative assessment using frailty, disability and co-morbidity. Ann Surg. 2009;250(3):449–455. Zenilman ME. Geriatric risk assessment in surgery: keeping it simple. JAMA Surg. 2013;148(12):1138–1139. Robinson TN, Raeburn CD, Tran ZV, Angles EM, Brenner LA, Moss M. Postoperative delirium in the elderly: risk factors and outcomes. Ann Surg. 2009;249(1):173–178. Ahmed NN, Pearce SE. Acute care for the elderly: a literature review. Popul Health Manag. 2010;13(4):219–225. Beveridge LA, Davey PG, Phillips G, McMurdo ME. Optimal management of urinary tract infections in older people. Clin Interv Aging. 2011;6:173–180. May M, Fuhrer S, Braun KP, et al. Results from three municipal hospitals regarding radical cystectomy on elderly patients. Int Braz J Urol. 2007;33(6):764–767. Peyromaure M, Guerin F, Debre B, Zerbib M. Surgical management of infiltrating bladder cancer in elderly patients. Eur Urol. 2004;45(2):147–153. Gunka I, Dostalík J, Martínek L, Guńková P, Mazur M, Vávra P. Advanced age – indication or contraindication for laparoscopic colorectal surgery? Rozhl Chir. 2010;89(10):628–633.